Vegan Runner Eats » Marathon Training » Weeks 9,10,11 of Marathon Training. 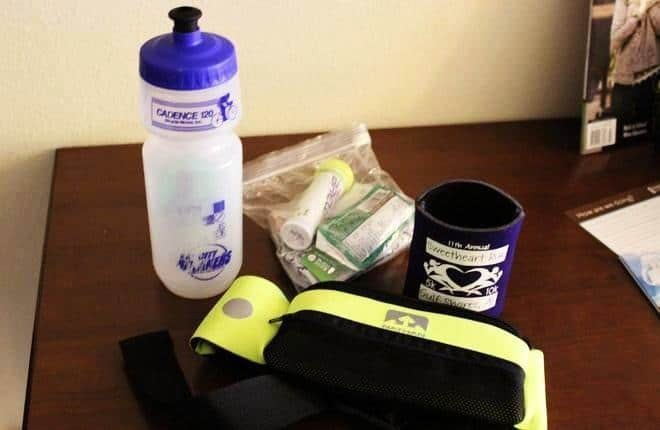 Staying on Track with Race Preparation when Traveling. Wow – It’s been three weeks since the last update on my ongoing marathon training! It’s no wonder there’s been a pause: all of the traveling of the past couple weeks took its toll on my dedication… but all is not lost! Sure, I’ll admit that it’s been a challenge to stay on track with my training while hopping all over the continent from Florida to Georgia to South Carolina to Washington state, but I promise I’ve been trying! So let me recall how I’ve managed to maintain my training routine in the last three weeks. At the same time, I try to look on the bright side: a little stress can be beneficial to us sometimes, at least it can take us out of the comfort zone and make us reassess our goals. I went through stressful moments before every big race I’ve ever done, and every time my races went better than I expected! This realization helped me stay grounded through week 9 and the following weeks. I tried to take it easy in week 9 after my 18-mile run that I did on Sunday of week 8. I still managed to fit in a couple of good runs and a couple of intense gym sessions that week, which made me motivated to keep up my training in the upcoming weeks that my husband and I would spend traveling. Week 10 was the most travel-intense for us. We had it scheduled as our vacation before we even knew that my husband’s job would be sending him to Seattle, WA area for three weeks as soon as we got back. Luckily, I was able to join him… but that would be weeks 11, 12, and 13, so I’m getting a little ahead here. Back to week 10. Our road trip-style vacation took us through Amelia Island, Fla., Jekyll Island, Ga., Savannah, Ga., Charleston, SC, and Atlanta, Ga. At every one of those locations, we did a whole lot of sightseeing, walking around, and eating whatever vegan food we could find (it wasn’t always in abundance, but we managed just fine 🙂 ). I knew that I wouldn’t be able to fully stick to my training plan, so I did what I could to maintain my fitness. This meant thinking outside the box, so to say: working out at a hotel gym using minimum equipment; doing an intense session of running up some stairs in my friends’ apartment building when no gym was available; and squeezing in a 7.4 mile run on a busy Sunday – the only day we got to spend back home in Alabama before heading off to Seattle on Monday morning. Of course, I wanted to find a chance to do more running during that week, especially since we were staying in historic downtown areas of such beautiful cities as Savannah and Charleston. The latter is known for a lovely running route that wraps around the southern tip of the Charleston peninsula… My attempts to get up early and go running in Charleston were messed up by my cell phone alarm not going off – twice! Boy was I frustrated… Oh well. You can’t win every battle, right? Repeat the entire sequence 5 times, for a total of 10 times of running up and down the stairs. This is a great and quick full-body workout for those occasions when a gym or any equipment is unavailable, and you want to get your heart rate pumping. Our newly adopted vegan diet turned out a blessing while we were traveling: before we (especially I!) might have pigged out on all the food that the region we were visiting had to offer, thus overloading on fat, sodium, and overall calories. Vegan food is usually much lighter (given that you know what to choose), has more fiber and nutrients, so we felt much more energetic the whole time. I was pleasantly surprised by how indifferent I was to the tempting vibes of a lot of places that used to be so appealing before, like bakeries and ice cream shops. I was at peace with knowing that if they didn’t have anything I could eat, then I wasn’t coming in. Hey, I’m not a saint, of course, and there might have been a few slipups, but nothing could compare with my all-out pig-outs from the olden days. 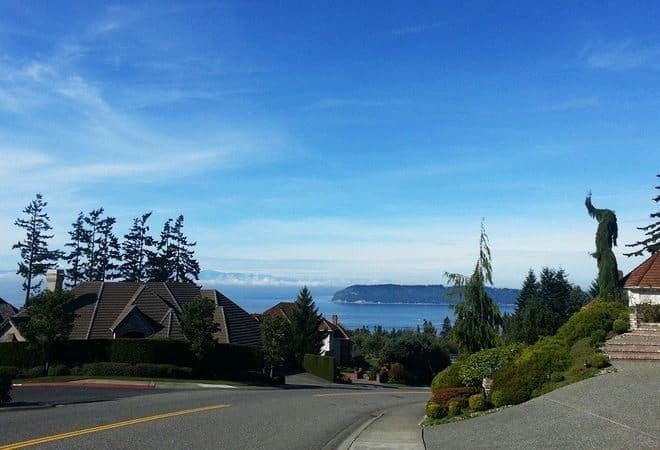 After arriving to Washington, I decided to make running and exercise my priority as I spend three weeks in a little town just to the north of Seattle. Our hotel has a pretty well-equipped gym (I only need some dumbbells and a bench anyway), and running outside is a breeze in all of the runner-friendly neighborhoods nearby. I’ve got a challenge, however: it’s way colder outside than it was in Alabama when we left, with the temperatures in the 50s as opposed to the 80s back home! For as long as I remember myself, sudden temperature changes like this one always made me come down with a cold – that’s definitely something I didn’t need! I heard that people who get sick a lot sometimes manage to dramatically improve their immunity when they adopt a plant-based diet. My newly adopted veganism was put to test, and I’ve got to admit: it worked! I’ve been perfectly fine and cold-free for a week and a half now, all while being exposed to lots of rain, wind, and cold weather outside. Feeling adventurous on Wednesday of week 11, I piled on multiple layers, strapped on my “fanny pack” with a cell phone inside, and went off on a short trail run in a park right next to our hotel. 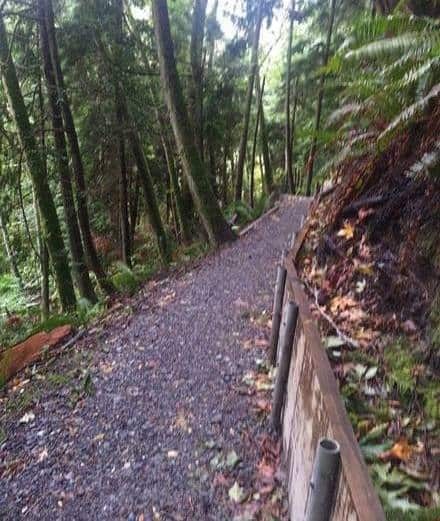 Little did I know that trail running differs so much from running on pavement! I was surprised by how much I slowed down due to A LOT of uphill and downhill running on a rather unstable terrain (gravel and mud after two days of raining), but at least I was rewarded with spectacular views! I did some exercising at the gym on Tuesday and Thursday, and then on Friday I set out on a long run – my first in three weeks! To make sure I didn’t end up injuring myself, I decided to do 10 miles: more than my average runs, but not too much that my body would get unhappy. It must have been my lucky day because the combination of cool sunny weather, fresh air and beautiful views (like this one below) made me want to keep going, so I ended up running 12.75 miles, with the last 9-10 miles at my intended marathon pace. To realize that I didn’t lose my fitness was a real confidence booster! All in all, maintaining my marathon training routine while traveling proved to be challenging but doable. I followed my own advice from this post, making exercise a priority and planning my sessions ahead, and I got to try some things I’ve never done before that boosted my confidence and gave me even more motivation no go on. Do you try to maintain your workout routine when traveling? Maybe you have a few tips on how to stick with your training plan when life interferes? Please share with us! Week 6 of Marathon Training. 5 Tips About Nutrition Every (Newly) Vegan Athlete Should Know. Tagged marathon training, motivation, Pensacola Marathon 2013, Seattle, traveling. Bookmark the permalink.